Detroit-based Discipline have been making music for around a quarter of a century but, amazingly, this is only their fifth studio album in all that time. Their line-up has also remained constant over the years, comprising charismatic frontman Matthew Parmenter (vocals, keyboards, violin, guitars, eBow and tambourine), Paul Dzendzel (drums) and Matthew Kennedy, but replacing Jon Preston Bouda on guitar for this album is Chris Herin of Tiles. Their dramatic live shows are of particular renown, Parmenter's alter ego being that of a spooky kooky clown, seated at his piano like a prog prince of doom. 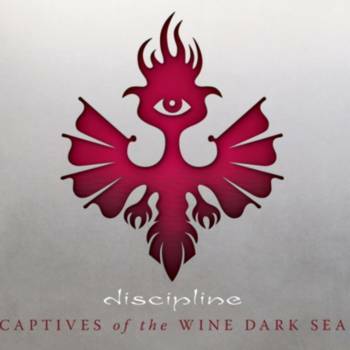 But, far from being a catalogue of misery and negativity, Captives Of The Wine Dark Sea is a collection of quirky, diverse songs, which, at certain junctures, enter territory previously inhabited by Van Der Graaf Generator in their pomp. Parmenter's vocal timbre, phasing and delivery echoes Peter Hamill's, especially during opener, The Body Yearns. It's an interesting track that has shades of Pink Floyd during one particular passage but Herin's guitar is slightly discordant and ringing in tone in contrast to Parmenter's fluent keyboards. The mood darkens half way through with almost gothic organ chords and a slower instrumental passage, after which Parmenter returns to sing. Life Imitates Art is much more upbeat with a great hook line recurring all the way through the song. Parmenter is right on the beat with his vocal passages and a harpsichord brings it all to a close. Lyrically, the song is a fascinating look at life through the eyes of an artiste as Parmenter declares: “Every song is about writing, every act is about words”. It's one of those clever little gems reminding me of something the great Neil Hannon (The Divine Comedy) would be pleased to pen. Jabbing, slightly eastern staccato guitar kicks off S, the first of two instrumentals which develops into an eclectic, fun, pacy piece, full of twists and turns and some heavier riffs. Parmenter on violin blends well with Herin's guitar and together, they offer lots of interesting textures before it changes tempo to a slower, atmospheric eBow passage. Love Songs is almost their version on 10cc's I'm Not In Love with its anti-romance sentiment. However, a delightful, whimsical little song which sounds very much like Paul Williams' 1971 classic Just An Old Fashioned Love Song down to some lovely almost honky tonk piano and great vocal harmonies. In stark contrast, Here There Is No Soul has a real Neil Young vibe through some gruff-sounding guitar chords over a steady rhythm before Parmenter rocks it up vocally, but it is over far too soon. The Roaring Game is the second instrumental and again has some wonderful tight interplay between guitar and keyboards with some recurring grand melodic sequences. It all motors along beautifully without losing momentum or shape, and particularly outstanding is Paul Dzendzel mixing up the rhythms. And finally, Burn The Fire Upon the Rocks is the scene-stealing album closer. It begins with a long guitar-driven intro that steers the track into quieter waters, where a calmer Mellotron sound dominates before the guitar returns with some softer vocal harmonies. The pace picks up again through choppy keyboards and a driving rhythm. Parmenter's plaintive singing dominates the simple guitar chords and piano before some lush vocal harmonies and synths take over. Then we have another guitar led passage, simple in construction but big on impact. The changes of tempo continue, a natural progression occurring in each before the final fade. This is a slow burner of an album that delivers more on each hearing. It is certainly one worthy of further investigation and catch them if you can playing live.